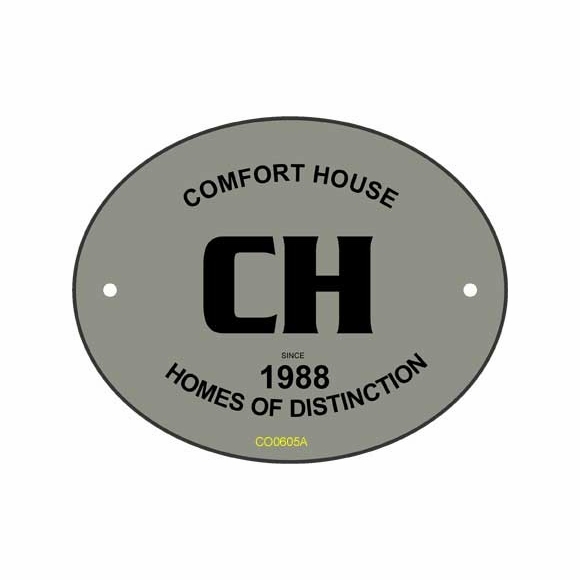 Small Oval Builder Plaque - - contractor plaque. Compact and rich looking plaque for contractors and builders. Designed to recognize and advertise your contribution to a construction or engineering project. The four lines of personalization, decorative double arch shape, and color mimic more expensive metal plaques, but at a cost that is budget friendly. Made in the USA. 6"W x 5"H oval wall mount plaque has four lines of personalization. Line 1 will hold up to sixteen (16) 0.25" characters. Line 2 for initials or name will hold up to five (5) 1.375" characters. If you wish to have a company logo placed on the plaque, please contact us. The small "SINCE" above the year is standard on this sign. Line 3 holds the year your business was established in this four-digit format: XXXX. Line 4 will also hold up to sixteen (16) 0.25" characters. Note: the style number on the sample signs is for internal use only and is not engraved into your custom sign. Made from sturdy and UV-stabilized, non rusting, laminated acrylic plastic with engraved personalization. Dimensions (approximate): 6"W x 5"H x 1/8". Plaque colors: brushed stainless or gold. Click top link in Related Products to view the gold color. Characters and border are black. Small 6" x 5" personalized advertising sign for builders, contractors, and other professionals in the construction business is both tasteful and well-priced. If you desire a different size or other customization, please contact us.